The German radio station SWR2 had a long association with Stockhausen, and broadcast over several years extracts from his enormous opera cycle - Licht - which has an opera for each day of the week. On 22nd August, it would have been the 80th birthday of Karlheinz Stockhausen, who died last year, and SWR2 broadcast a sequence of extracts from each opera, interspersed with commentary from Stockhausen himself in interviews with Reinhard Ermen. So, in the space of about 3 1/2 hours, a condensed version of this enormous cycle could be heard, including some of the more well-known episodes, such as Welt-Parlament and Helikopter-Quartett. The commentary is in German, but is conversational and easy to follow, starting with an explanation of how the idea for the cycle came to Stockhausen in a temple in Kyoto after he had completed Sirius. 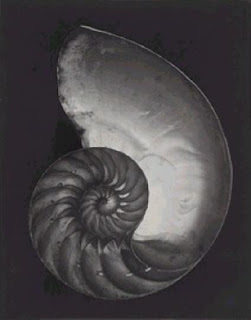 Many of the ideas and themes which make up the mythology of Licht receive extended commentary. Moreover, I think you can get a sense of how Stockhausen began this with an idea rooted in a compositional framework he controlled, how a surrounding mythology emerged and entered his dreams and very being, his struggle with and acceptance of that and a final sense of weariness, relief and transcendence. 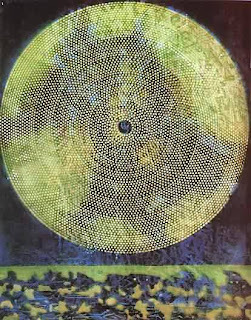 The picture above is Max Ernst's Birth of a Galaxy, which seems appropriate for something on this scale. Continuing with the bass clarinet theme (after the previous posting of Michel Pilz), here are two in one go. 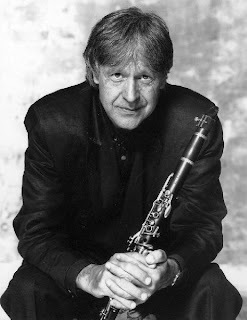 In particular, Michel Portal has made the bass clarinet his primary instrument, but here he picks up the sax and a bandoneon as well. 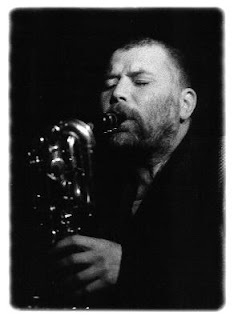 Peter Brötzmann is mostly known for his tenor work, but here he switches to bass clarinet and a bunch of other instruments. And even Han Bennink dabbles on the clarinet in between hammering the kit and the bass drum. So, all in all, about 40 minutes of anarchical merriment, recorded in a Paris studio in 1977, and broadcast on radio, though details are scanty. The announcer butts in at about the thirty minute mark to tell what's going on, but no titles to the piece. Brötzmann and Bennink are mates of 40 years standing, but the presence of Portal adds another dimension to this set. I leave it to the listener to figure out who is who, but I find Portal adds a melodic touch to the fierceness of Brötzmann, but Portal can be as screechy as the other guys when the fancy takes him. 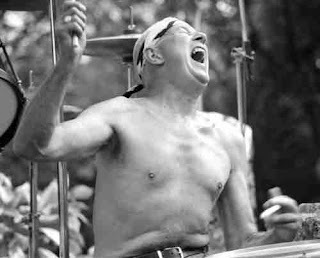 Han Bennink: small drum set, "soft trumpet", clarinet, viola, xylophone, whistle, piano, various percussion, etc. Looking back through the blog, I see that no Zorn recordings have been posted, which is surprising considering all the Masada and Bladerunner stuff that was upped at Church #9. I can't say that I like his more esoteric stuff, but this concert really swings. Links in comments. Many thanks to moretoonz for seeding. Lineage uncertain, but excellent sound quality. hey ,having some problems with volume 3 of this set so heres the final volume..possibly the most adventurous grouping in the set. though Dagmar's vocals wont thrill everyone , ( me im an old Henry Cow/ art bears fan). Recorded in the studio in NYC 17th March 1971. Barry Altschul, drums, kalimba, percussion. The second of two Circle releases which were inexplicably issued only in Japan, initially on vinyl and later on CD. As before, if anyone can throw some light on why this music was never issued in Europe or the US, the information would be very welcome. This rip is taken from the original Japanese vinyl, CBS Sony SOPL 20-XJ. The performance is a single two-sided composition credited to Corea alone, and if any listener can sense a line drawn between one man's composition and four men's improvisation, he's a better man than I. The piece opens with much of the heat and intensity associated with the free jazz of 1971, with Altschul especially taking few prisoners, before the quartet veers off into extended flute and percussion workouts, a certain amount of navel-gazing and a question-mark of an ending. Perhaps Corea's own words, from the liner notes, best sum the piece up: "Our music is a focal point, constantly created anew, with each playing. … It is our opinion that creativity will play an important role (maybe the important role) in lifting our consciousness about ourselves and others. 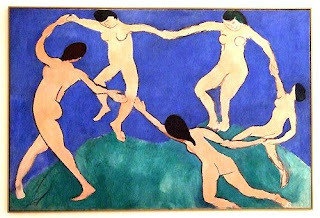 … When we are alive in the fullest sense of the word, we are creating". Recorded in Germany, 28th November 1970, location not specified. (The record is indeed grammatically mis-titled, as above). The first of two Circle releases which were inexplicably issued only in Japan, initially on vinyl and much later on CD. Why this music was never issued in Europe or the US is a mystery to me. Can anyone throw some light on this? This rip is taken from the original Japanese vinyl, CBS Sony SOPL 19-XJ. By early September 1970, Corea and Holland had both left Miles' adventurously electric band, and quickly settled into acoustic free jazz territory. 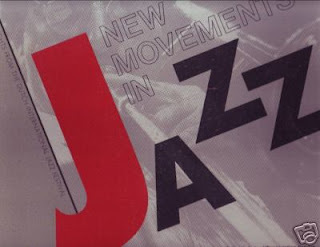 After a brief studio fling which month which produced "The Sun" LP (with Liebman, Grossman, DeJohnette and others), they cemented themselves with Braxton and Altschul, and Circle became the focus of their joint activities over the following 9 months. This concert features two side-long Circle staples: Dave Holland's "Toy Room - Q&A" and the standard "There is No Greater Love". Both pieces will be familiar to Circle fans but, as ever, these interpretations are intriguingly different. Classic Circle trademarks are all here in good form: Corea's propulsive piano, Braxton's Chicago-inflected blues, Holland's melodic hold on the roots and Altschul's meticulously tuned percussion. And there's a little "fly in the ointment" - on side B behind Braxton's alto solo, either Corea or Holland double up with him on … flute? oboe? musette? A teaser for your ears. Date ? / Venue ? Recorded May 26th 1986 in Germany. Here's a share from drhotte that he (?) posted in the comments of my last El' Zabar posting. I wouldn't want you to miss this one. No essay this time; but enjoy the music. 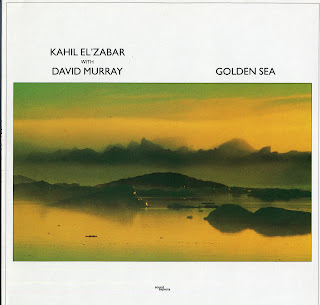 Kahil El'Zabar and David Murray seem to bring out something special in each other. They've been consistent collaborators: El'zabar has been in a couple of Murray's quartets (including the excellent, but hard to find, People's Choice) and a couple of Octets; while Murray's been on four duo albums under El'zabar's name. All the duo recordings are worth owning, but this (for me) is the strongest. It's also sadly the hardest to get hold of; and I'm not sure it even got a CD release. 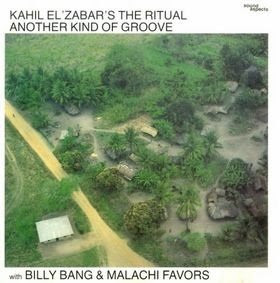 El'Zabar and Murray share an interest in Afro-centric music and pan-African culture, and this is apparent in much of the music here. The very title of Murray's 'Song For A New South Africa' is an index of this. However, the orientation is surprisingly best achieved on their interpretation of Miles Davis' 'All Blues'. Murray is at his plaintive best on Bass Clarinet, while El'Zabar plays the Mbira or Sanza (which the LP lists as separate instruments, but which I've always understood them to be two names for the same Shona 'thumb piano' instrument). The track reaches its peak with Murray playing and El'Zabar singing. This is, perhaps, my favorite piece of Murray Bass Clarinet 'ballad' playing. He seems to take a perverse pleasure in playing a bass instrument beyond its usual highest frequencies, and draws upon the textures of gospel playing to create a sound I find deeply affecting. A haunting and beautifully realised cultural and musical fusion. 'Sunrise Serenade' features El'Zabar alone on Mbira/Sanza with ankle bells and a wordless vocal and rhythmic chants. It's one of the best tracks on the LP for me, though regular visitors to this blog may find it a step too far beyond jazz sensibilities. Each track has a distinctive texture, achieved most often by El'Zabar's use of different percussion instruments (Murray has never made major changes to playing style across his whole career, let alone an LP). 'Dreams' features a hand drum (I'm guessing it's the Ashiko drum) and a more meditative and gentler start for Murray on tenor before his characteristic gospel-rich style kicks in. I'm also speculating when I say this sounds like a total improvisation from Murray; a notion backed up by the fact that none of the pieces credited to El'Zabar have strong melodies (a Murray characteristic). I think the balance (on this track and the whole LP) works very well overall, though, giving a sax and percussion duo album a lot of variety. For Sweet Meat El'Zabar plays conventional jazz traps with lots of cymbal ride and rhythmic work on the tuned drums while Murray's ecstatic tenor runs build in intensity. This is possibly the most conventional duo piece, but executed with panache. 'Song For A New South Africa' features a poly-rhythmic hand drum and ankle bells textual bed, and a fairly straight-forward rendering of the strong melody riff by Murray. They clearly liked this number because the duo repeated the piece on record three years later on A Sanctuary Within, and thirteen years later on Love Outside Of Dreams with very similar, if slightly more complex renderings. 1989 was a classic year for Murray, and his work made available in that twelve moths is remarkably wide. Albums released in that year included a James Brown-tribute funk project (Cold Sweat), a challenging piano-sax duo with Dave Burrell (Daybreak), an attempt at the jazz mainstream through the Columbia-released Ming's Samba, four other jazz quartet albums under different group names and for different labels (I Want To Talk About You, Last Of The Hipmen, Lucky Four, The Fo'tet), and a WSQ collection of soul covers (Rhythm & Blues). This one fits in the eclectic moment comfortably. I hope you enjoy it.